II What is an Animal Model? 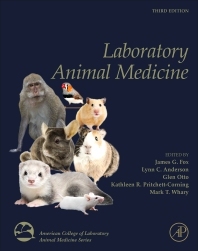 Laboratory Animal Medicine, Third Edition, is a fully revised publication from the American College of Laboratory Medicine’s acclaimed blue book series. It presents an up-to-date volume that offers the most thorough coverage of the biology, health, and care of laboratory animals. The book is organized by species, with new inclusions of chinchillas, birds, and program and employee management, and is written and edited by known experts in the fields. Users will find gold-standard guidance on the study of laboratory animal science, as well as valuable information that applies across all of the biological and biomedical sciences that work with animals. Veterinary and medical students and researchers who utilize animals in biomedical research. James G. Fox, DVM, MS, DACLAM, is a Professor and Director of the Division of Comparative Medicine and a Professor in the Division of Biological Engineering at the Massachusetts Institute of Technology. He is also an Adjunct Professor at Tufts University School of Veterinary Medicine and the University of Pennsylvania, School of Veterinary Medicine. He is a Diplomate and a past president of the American College of Laboratory Animal Medicine, past president of the Massachusetts Society of Medical Research, past chairman of AAALAC Council, and past chairman of the NCCR/NIH Comparative Medicine Study Section. He also is an elected fellow of the Infectious Disease Society of America. Professor Fox is the author of over 490 articles, 80 chapters, 3 patents and has edited and authored 13 texts in the field of in vivo model development and comparative medicine.